We are able to transfer all standards of DVCam / Mini DV / HDV and DVCPRO from the US (NTSC), UK (PAL) and also 25Mbps and 50Mbps DVCPRO formats. We can do motion compensated standards conversion, so if the video tape you have is in NTSC format we can deliver your digital file in PAL (and vice versa). We are equipped for video noise reduction and overscan removal. We can deliver your digital files in any of the following formats: Apple Quicktime /MOV in any codec, 10 bit uncompressed (recommended), AVI in any codec; any MacOS, Windows or GNU/Linux filesystem (HFS+, NTFS or EXT3) and DVD. The main problems that arise from Mini DV is the size of the tape. The tape is very thin and fragile, and there is little margin for error if things go wrong. Mini DV were used in domestic camcorders which had less well built tape transports that made tape damage more likely. The machines were also prone to make unaligned recordings, consequently leading to interchange problems (the ability to record on one machine, and play it back successfully on another) that effect the quality of the transfer. Mini DV used metal evaporated tape formulation which had a problem with excessive drop outs (on DV recordings this means the image becomes pixelated). If you have a bad glitch on digital tape it is likely that when repaired, parts of the recording will be lost. Compare this with analogue tape which degrades more gracefully, and can be spliced together so that the majority of the recording can be saved. Problems can arise with digital tape in general if there are no visible defects with the tape. In the process of transfer the tape may become unplayable, leading to the loss of information. We therefore recommend that you migrate your digital tape files as soon as possible, because of dramatic degradation which can uniquely effect digital tape. DVCAM is a variation of the Digital Video format developed by Sony and aimed at the semi-professional and lower-end professional market. 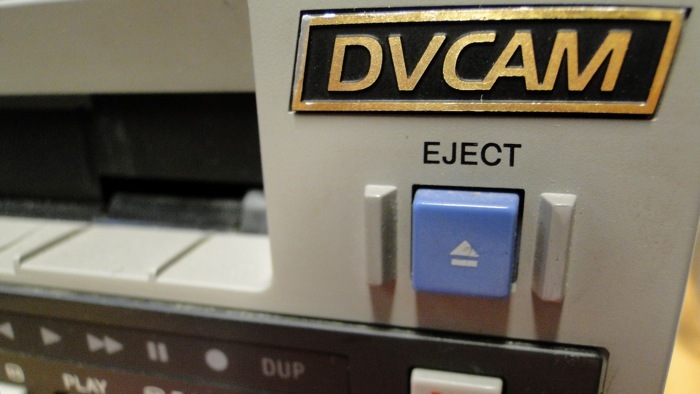 DVCAM uses the same type of tape and compression as DV and MiniDV but at a higher speed (almost 50% faster). It is more robust because it was housed in a bigger cassette and had a faster tape speed. Mini DV was introduced in 1998 and is the consumer version of DVCam. MiniDV captures video and audio on high-density cassette tapes. The format delivered sound and video that is sharp and high quality compared to analogue recordings. Another benefit was its flexibility and ease of transfer to devices such as laptops, where material could be easily edited. It is still possible to buy mini DV tapes today, and relatively easy to acquire the camcorders second hand, but they have largely been superseded by digital camcorders that record to disc.